Samsung's goal with the Galaxy Note 10.1 2014 Edition is to bring productivity on tablets to a whole new level. 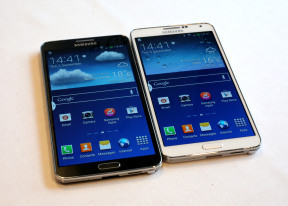 Last year's Galaxy Note 10.1 brought split-screen mode that gave users two apps to work with instead of one. The stylus brought the content on screen closer to users and gave them the option to interact with their own hands - drawing and scribbling, making it personal. But we've always felt it wasn't the best Samsung could do in terms of hardware, offering a screen with an okay resolution and internals. Well this year things are about to change and improve. The Samsung Galaxy Note 10.1 is back with new tricks up its sleeve and a whole lot of improvements all round. The name, however, is somewhat of a head-scratcher - instead of going for something more elaborate like the Note 10.1 HD or something, Samsung decided to go all-Apple on consumers and dub this one the 2014 Edition. Misc:S Pen Experience with S Note(Easy Chart), S Planner, Air Command: Action Memo, Scrapbook, Screen Write, S Finder, Pen Window, Direct Pen Input. Anyway back to changes and improvements. The 2014 Edition Galaxy Note 10.1 comes with the same screen diagonal (at 10.1-inches), but pumps up the resolution from 1280 x 800 px with the modest ppi of 149 all the way up to 2560 x 1600 px with a resulting pixel density of around 299 pixels per inch. Where there was plastic now there's a leather topping on the back panel. There are even contrasty stitches for a more realistic feel. The bezels around the screen have had some work done too and appear slimmer now. The S pen has been moved from the bottom to the upper-right corner, multi-window has been significantly improved and now allows two instances of the same app to be launched, which is very useful for browsing. Samsung has added Air Commands, which pop up when you take out the stylus and gives you options like action memo, which lets you write something down and then use it within a supported app (for instance writing a phone number can invoke the Phonebook app to save it). Scrapbook is another improvement that can collect pretty much anything you have selected on screen into your own scrapbook. There's S Search, which is a universal search that browses the tablet's memory for anything from words to numbers and even hand-drawn symbols. If you hover the S pen over a text field and the software is quick to react and give you the option to start writing. The S pen can now be used not only the screen but on the capacitive keys as well so it's fully functional in operating the tablet without you ever needing a finger. There will be a 32 and 64 GB versions of the Galaxy Note 10.1 2014 Edition but being microSD-capable we don't see much sense in paying for the 64 gig option. The Samsung Galaxy Note 10.1 2014 Edition comes in two colors - black and white. Both feature a glass-covered font and a plastic back with a leather-like finish, which not only serves to add a bit of sophistication but also nicely enhances the grip. The slate feels lighter than its predecessor and is more space-efficient. The bezels look like they've been trimmed as well. Edges appear sharper on the latest Note 10.1 and coupled with the aforementioned bezels give a more conservative, business-like allure to the package as a whole. The tablet is also thinner, which adds to its sophisticated look. Although Samsung hasn't altered the design thoroughly, we welcome the leather-like texture over the gloss and smudges-ridden plastic panels of old. The screen on the Galaxy Note 10.1 2014 Edition is easily the best we've seen on the market thus far. At 2560 x 1600 pixels it's far above FullHD resolution and with a diagonal of 10.1" it outputs a whopping 299 pixels per inch, meaning individual pixels can be discerned only if you try really hard, looking from really close up. Previously the stereo speakers were mounted on the front of the device, which worked slightly better when working with the display head on. Now Samsung has decided to move the speakers over to the sides, which doesn't appear to hurt the user experience all that much. The S pen has been moved as well. Previously resting on the bottom right corner of the Note 10.1 tablet, the S pen is now more intuitively-placed at the upper right corner so it's more easily accessible. The white color option of the Samsung Galaxy Note 10.1 2014 Edition struck us as the all-round better looking of the two. The silver plastic edges work more favorably with the white front and back panel and so do the silver accents like the camera lens and home button. Although more feminine in its general appearance, the white Galaxy Note 10.1 2014 Edition can still be considered a unisex device, just a little more youthful in its demeanor. The 2014 Edition Samsung Galaxy Note 10.1 is much snappier than its predecessor and has a more refined build along with some logical and more intuitive design decisions. It's a step up from the Note 10.1 of old in every feasible way and probably the best tablet you can get in terms of multimedia delivery and sheer productivity prowess. Despite aiming to go head to head with an iPad that clearly has its focus elsewhere, the Galaxy Note 10.1 of 2014 Edition is a great choice for a slate in its own right.